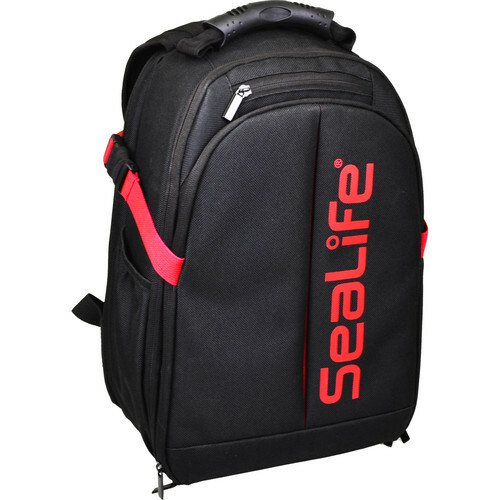 Photographers working in wet environments will appreciate the black Photo Pro Backpack from SeaLife. The pack is designed to store, transport and protect a variety of cameras, lenses, and related gear. A waterproof lining helps keep adjoining compartments dry. Padded, touch-fastening, interior dividers keep your equipment organized. Additional items are easily stored in the front zippered compartment. There's also a retainer strap for added security in case the zippers become compromised. Durable nylon construction, corrosion-proof zippers, six rubber feet and drain holes on the bottom make the Photo Pro Backpack well-suited for shooting by the sea. Carry the pack with the padded top handle or wear it with the shoulder straps. Box Dimensions (LxWxH) 18.5 x 11.5 x 6.5"